Maybe look at some charities and see what they require...some have size requirements or how they are made. I think any pattern you choose would be great...I look on Pinterest for ideas sometimes. Try looking into Project Linus or Quilts for Kids websites and see what they need. Nice of you to be so generous and care about the pattern. If you want to keep them local, check with the local hospital to see if they have a need. Also, some police keep a quilt or blanket in the patrol cars for emergencies. When children are injured or taken from their homes it can be nice to have on hand. I would try to make a pillow case for these so if the children need to "pack" they will have something nicer than a garbage bag to carry their belongings. Simple patterns are best, just use interesting colors and fabrics. I have quilted and sent many UFOs that friends have given me and some that just didn't turn out like I thought they would. Not all of Project Linus's quilts are for babies, just whomever needs them in emergencies. Ronald McDonald House is always thrilled to receive quilts, but they prefer that they be throw size. It's easiest if you find a charity with a drop-off location convenient to you. I have mailed some charity quilts, and the cost of postage is a *lot*! Just found a Project Linus drop-off location near me and will be switching to them. Here is what I use. Just the right size for a baby. Last edited by mary quilting; 05-22-2013 at 11:00 AM. Battered women's shelters love to receive quilts. They would have children there. And lots of other suggestions you've already received. I make my baby quilts about 45" x 54". There are a lot of baby panels that are 36" x 45". I think they're intended to be finished size, but I always add about a 5" border all around. There are baby fabrics that can be cut into squares to make a quilt. Just random squares of a size you like would work. If you cut 6" squares, you'll get 9 squares out of a fat quarter. The squares will finish at 5.5", so a quilt 7 squares x 9 squares would be 38.5 x 49.5". There are quilts that are just strips of baby fabric, alternated with another coordinating fabric or solid. Just make those the width of fabric, and the length that you want. Then I was about to mention the one listed just above, but it's already there. Actually they are very picky about the size. My friend's exquisite quilts were declined because they were 2 inches too short They drove to the nearest fire station where they were graciously received. How do you find a homeless shelter to donate to? Also, what size/type quilts does the humane society need? These are two charities I would like to make donations to but not sure how. 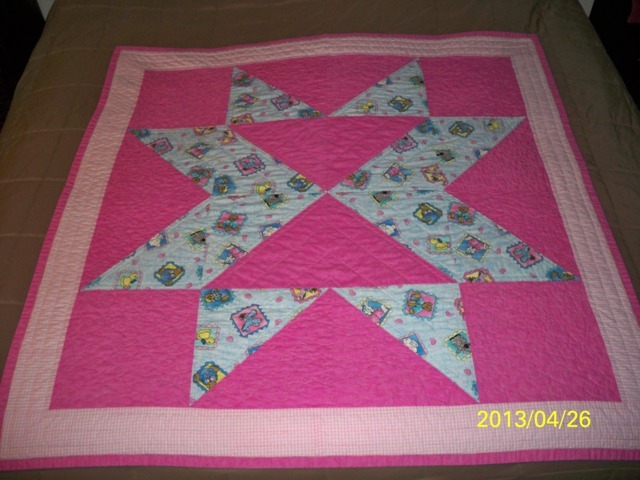 I contribute to QuiltsforKids.com. If you have a chapter in your area, you can give the quilts to them and they will stay local. Their website has info on what they accept and free patterns. Also, you can ask for a free kit which contains fabric to make a quilt, you just provide the batting and binding (or you can self-bind). A lot of communities have committees that seek to help with local homelessness. If you don't have that or can't find it, check with the mayor's office or any city commissioner. In some communities the Salvation Army or Rescue Mission serve homeless with temporary shelter. Many churches serve the homeless with meals or shelter and are frequently part of a group of churches sharing the effort in an organized fashion. It should not be hard to find where the shelters are and what the needs are. My mother lives in a rural community without a shelter. She and her church quilting group donate quilts to the county welfare office and the sheriff's office. Those public workers come in contact with people who are in need of warmth. Those offices are also aware of the location of women's shelters in the region. I donate quilts to Project Linus. If you go to the meetings, you are able to pick up kits that have been put together if you can't afford to donate all of your own fabric. The kit will include the simple directions, all fabric for front, back and binding. It also includes the batting. You only have to provide your time and thread. Our local branch is also a sponsor of the annual Operation Snowball in Dallas. This is a free event for children who have lost a parent in the military during the previous two years. Every child who is there gets to pick out a quilt to take home. Last year there were over 1,000 quilts distributed at this event. Some of the other organizations are a little bit more picky about the sizes of the quilts they accept. PL just wants kid-friendly fabrics in a quilt that will hold up to being washed quite often, especially if they are donated through the hospital. Find a local charity in your community that will take them. My guilds both give to foster children via a private agency that supplies clothing, quilts, school supplies, etc. to kids removed from their homes with, quite literally, the clothes on their backs. I volunteer at that agency - It's a wonderful thing to see the kids choose their own quilts. Nursing homes may also be receptive to getting lap size quilts for their residents. Get in contact with your LQS and they will put you in touch with the right party. All the quilt shops know all the guilds. This is the easiest and quickest baby quilt I have made. Could be made any size, depending on the size of blocks and borders. I used 12" blocks. 2 color checkerboard w/happy colors....also Binkie Patrol. The quilt guild that I belong to does this. You might want to check local quilt guilds in your area to see if they do this kind of service. All the baby quilts and lap quilts we do help local organizations in our community. Amen to that. I've been sending all of mine to Quilts For Kids but the shipping costs are getting insane. I'm checking in with a couple of friends that are in guilds that donate locally and that is what I plan to do in the future. I use this one as well. Quick, easy, no fabric "waste," a decent size and three different looks with a FREE pattern! I am very active in my local Binky Patrol and make lots of donations to the SPCA.